At the Spring 2018 European Healthcare Design Conference in London, England, Senior Associate Gavin McLachlan presented a poster that explored issues of security in mental health design. Entitled ‘Haunted: Addressing the memory of violence in a design culture of security’ his presentation asked the questions: Is the environment of security responding to harmful behaviour or catalysing it? Can a client recover, take ownership and agency in an environment that echoes a history of silence and oppression? Even in environments centred around the recovery model of care, design decisions are monopolised by discussions regarding security and liability in response to the increased number of incidents of violence. This trend in design includes any bed environment geared towards a vulnerable sector of the population, be it Inpatient Mental Health, Long Term Care or Shelters. While front line staff see additional staff and training as a response to security concerns, there is an increased tendency towards built and technological solutions that are, on the surface, more demonstrable and easier to quantify. This aligns with a dependency on data-based justification for decision making and a shift away from staffing as a solution to security that can also be directly involved in the delivery of care and service. A staff-lite building approach focuses on Material, Space Planning and Technology but brings with it a legacy condition from the environments that inform the solutions. The material and technology that is geared towards “Security’ comes from the same industry that serves the corrections/detention market. “Tamper Resistant”, “Abuse Resistant”, “Anti-Ligature” and a space planning methodology that is focused in control points, physical boundaries and sightlines are all strategies that replicate the detention environment. The technology solutions that are introduced are often focused on passive recording through CCTV, a security approach that is not preventative but is used to determine liability after the fact. Taken together, what results is a contradiction. Recovery based care is now delivered in a physical environment modelled on an ethos of control and punishment. The Client, often with a negative history with institutional environments, brings that memory with them in to the new facility. The staff member is asked to change their behaviour and the way they deliver care to accommodate a new built environment that reduces the client to the role of potential aggressor and the staff member to potential victim. Irrespective of a client’s acuity or potential for violence, they now operate in an environment oriented towards the worst-case scenario. The client space and staff space are both homogenous on either side of the border of the glass walled staff station that sits at the centre of its radial arms of smooth corridors. The ‘normalized’ environment of recovery is now artificial in the makeup of its population. Any variety typical of a community is gone. The ability to socialize atrophies. The physical separation of staff and clients generates frustration for both parties. The client cannot be heard on their terms without escalating; the staff member cannot have a meaningful interaction without exiting the newly defined ‘secure’ space in to one that carries ‘risk’. The inequity is now more apparent. Staff have more freedom of movement and freedom to withdraw from the care environment. With the inclusion of wearable staff assist, the staff can always ask for help but the client never can; they are always dependent on a staff proxy. The diagrams of sight lines lead to a kind of magical thinking, that from one secure position the staff member can cover the entire unit. This, coupled with the camera coverage, helps legitimize under-staffing so that the only practical way staff can observe a unit with the hopes of minimizing harmful behaviour is through the CCTV cameras. Cameras become installed in private bedroom sans any notion of personal space and ownership breaks down. Wearable tracking devices for all patients allows for personalized care plans, including a flexible approach towards entry and exit to the unit. This also minimizes casual interaction between staff and clients, or the difficult, necessary conversations around care. Overall, a culture of management, assessment and judgement develops instead of one of engagement and recovery. Communication is mediated by a speaker, camera or wearable device. Empathy and familiarity breaks down. Frustration leads to an event. The event is logged and liability is assessed. The unknown factor is risk. The risk is the client. The log becomes data which becomes evidence and informs the next design. 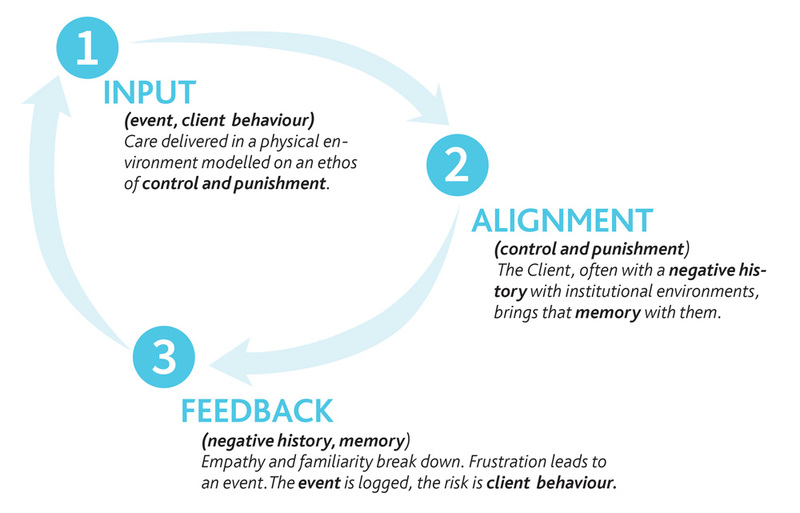 The risk of client behaviour is used to legitimize design decisions that drive to the managed environment when factors such as cost, staffing etc. are the actual drivers. Can there be recovery without trust? 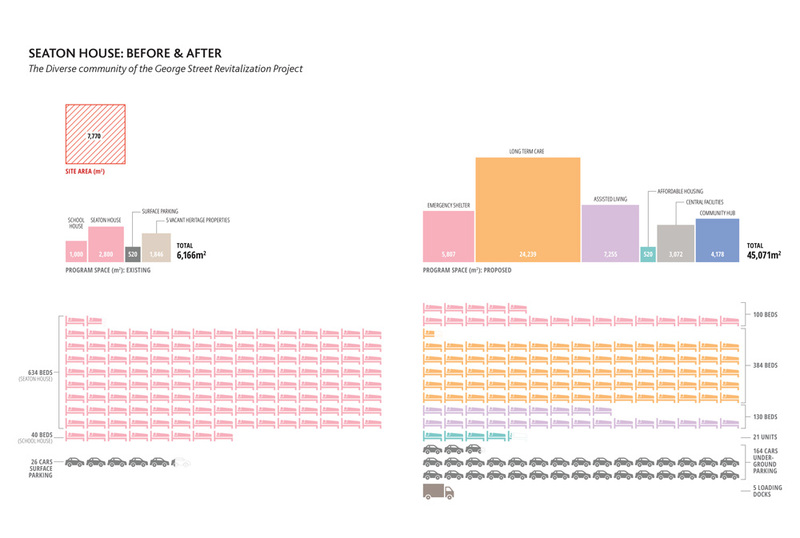 Our work on the George Street Revitalization presents an alternative approach to security. The George Street Revitalization Project in Toronto, Ontario, Canada provides an alternative approach to a recovery care environment. GSR replaces an existing, homogenous, men’s Emergency Shelter, one with a design capacity of 400 that peaks to almost 700 in the winter months, with a diverse and multi faceted care-based community. The Emergency Shelter component remains in a more humanized 100 bed capacity and is now linked, on site, to a series of related Divisions. 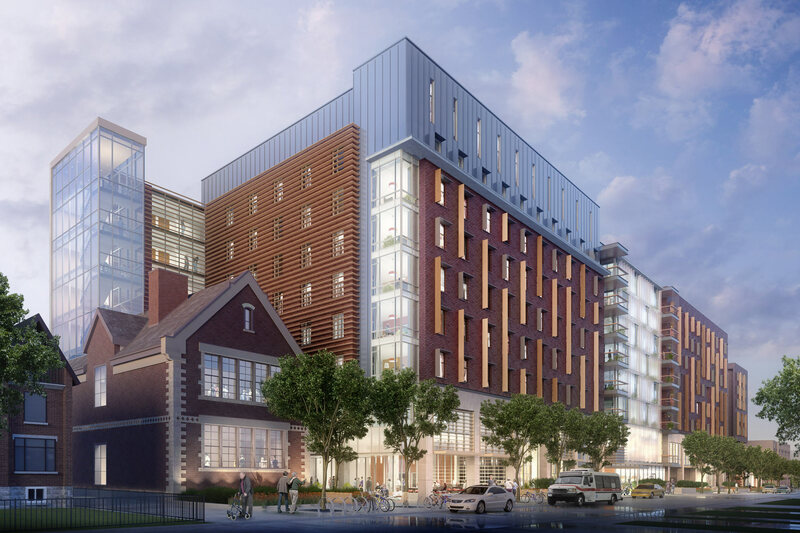 This includes a 384 bed Long Term Care program, a 130 bed Transitional Living Program that provides beds for Shelter residents in need of more focused care and twenty-one Affordable Housing Units. What has not been replaced are the principles of Harm Reduction that served as the operational foundation of the original Shelter. This now informs each Division in the new building. The Divisions share resources, such as kitchen and laundry and the most stringent performance standards of any one Division applies to the whole. The Divisions are physically and visually linked to each other and the street beyond and share the principles of dignity and harm reduction across all the programs. An Environment that respects the distinct needs of each Division and their clients and residents. All three care Divisions and the Affordable Housing Units are organized around an interior main street that also serves as the address for a range of Community Hub services. The building has knitted together the Divisions without compromising their basic performance requirements. The LTC maintains a secure perimeter for patients with Dementia yet the LTC program floor remains visually connected with the Community Hub Main Street below. Those LTC activity spaces that could also be utilized by other programs, such as Transitional Living, are located at the boundary between the Divisions so as to better leverage their use. Following a principle of being both safe and porous, Residents and Clients have their own Access Control devices that provides both access and a sense of ownership as they have secure access to their own private spaces, such as bedrooms. These devices are identical to those worn by staff, reducing any associated stigma. While all staff now share common elements, such as a single building staff room, the specialized skills unique to the staff of each Division isn’t lost and, instead, can now support the other Divisions in the building. LTC staff can help support Transitional Living Residents who ay suffer from dementia and reciprocally the LTC can receive support from Transitional Living and Shelter staff on issues related to addictions. Critical items are addressed by the immediate Division community. For example, it isn’t the GSR building security that responds to a code white call, it’s the immediate staff of the respective Division as the familiarity between staff and clients/residents helps reduce the risk of escalation. The Project recognizes that residents and clients may utilize any of the Divisions at any one time and that moving from Division to Division may not be entirely linear. A client of the Emergency Shelter may move in to Affordable Housing may then move out of the building but return for services in the community hub. A client of Transitional Living may enter the Long-term Care and then also take advantage of services in the Adult Day Program. Recognizing this internal movement, every effort has been made to take a normalized, non-corrections-based approach to the materials in the building. The residential qualities of the Long-Term Care and Affordable housing Divisions inform the material choices in the Emergency Shelter and Transitional Living Divisions. There is no stigma built in to the appearance of any one Division and no corresponding stigma associated with any Resident or Client group. This empowers the client/resident, strengthens their relationship with staff and in turn breaks the cycle of institutional violence and de-humanization. What results is a recovery-based community built on respect, dialogue and trust.